Cooking with the Word: Fed While Being Fed | Free eBooks Download - EBOOKEE! 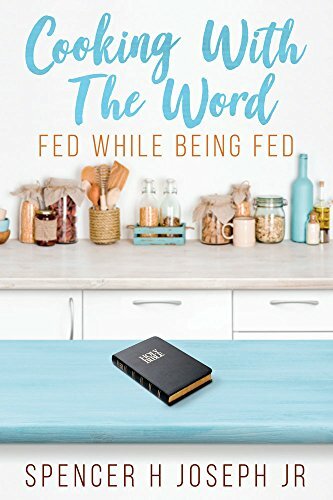 Cooking With The Word: Fed While Being Fed combines comfort food recipes with practical teaching on biblical subjects. The recipes are as easy to follow as the biblical lessons. The approach of teaching God's Word by appealing to the natural then the spiritual is the same way we should spread the Gospel. Cooking With The Word is unique in it's approach and is the first of a series of books along with an upcoming line of children's books titled Bible in Time. The book speaks on bread, The Fruit of The Spirit, and the Armor of God. Bread, as a staple, applies to our lives naturally then spiritually. Sections on The Fruit of The Spirit and The Armor of God, offer a clear explanation of their respective parts and explore what Paul was trying to convey to his audience. Cooking With The Word not only gives an easy understanding of the Word, but also how to apply the Word in our lives. Spencer H Joseph Jr was born and raised in Port Arthur, Texas where he was taught a healthy respect for the love of God and the power of His Word. He later moved to Hockley, Texas, a small rural area just outside of Houston. While a member of Jordan Memorial Church of God in Christ, he finally accepted his calling to be a preacher and teacher of God's Holy Word. In 2017, he graduated from the T.D. Iglehart School of Ministry. He knew that God had given him a message to pass on, and the knowledge and guidance he received from his instructors and leaders helped him put the God-given words down on paper. Cooking has always been a passion of Bro. Joseph's. His smile comes from the joy in others when they ask for seconds. The happiness he feels when cooking is only surpassed by the love he has for his family, and above all, the love he has for the Lord God. No comments for "Cooking with the Word: Fed While Being Fed".